PRICE REDUCED!!! 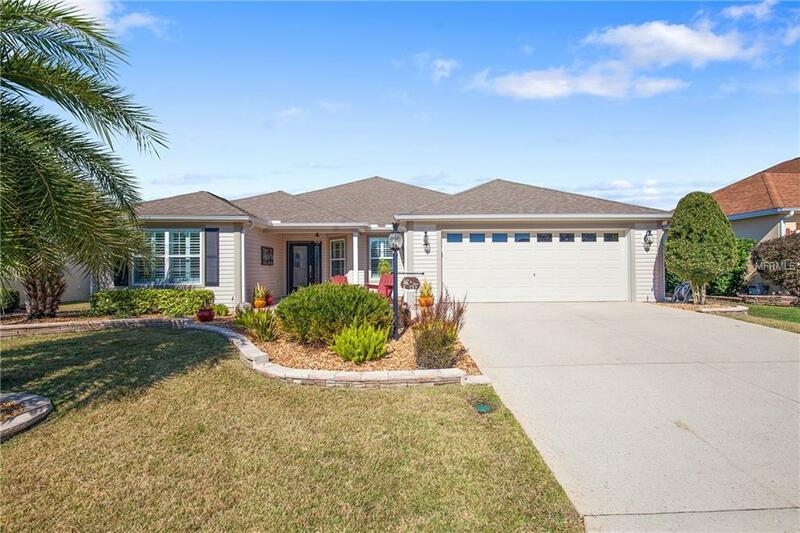 You will not believe this awe-inspiring beautifully enhanced 3/2 (3rd bedroom has no closet) Camellia model as it is like no other in The Villages!!! You will be proud to call this "home as there are no builder-grade finishes here and only an abundance of quality upgrades. Situated in the centrally located Village of Bonita, one enters the home through a leaded glass door allowing natural light to fill the home and there is porcelain tile plank flooring throughout the home no mismatched floors with uneven transitions. The kitchen has multilevel Java cabinets with recessed lighting with LED bulbs, two cabinets with glass doors, glass tile backsplash, under cabinet accent lighting, stainless steel appliances, and of course granite. The columns have been removed allowing more space to move about and giving an open concept to the home, which is so popular today. Upgrades include extended garage, plantation shutters, custom rods and drapes in living room and master BR, custom lighting and fans, enclosed lanai with acrylic windows, bead-board walls and ceramic tile flooring on lanai, glass door in guest bath, and water conditioning system. In addition, the roof was replaced in 2012 by Owens Corning due to defective shingle settlement (no leaks) and there is a Home Warranty in effect until July 2023 that conveys to the new homeowner. Why are you still reading this? - CALL NOW! Bond balance $15,055.60.